Safari to Botswana with spectacular game drives into wonderful landscapes. Photos of Botswana. WHAT TO DO AND WHAT TO SEE IN BOTSWANA? This trip review focuses on an African safari trip from Johannesburg to Victoria Falls, throughout Botswana, visiting the most beautiful spots for best wildlife viewing. Lion, elephant, hippo, antelope, impala, leopard, buffalo, hyaena... the list is long and includes also birds, as well as nice trees, like the giant baobab. The itinerary starts and finishes in Johannesburg, South Africa, and goes through Magkadigkadi Pans, Maun, Okavango delta, Chobe National Park, Moremi reserve, Savute and Victoria Falls. The trip is therefore recommended for any nature enthusiast looking for excellent game drives and spectacular landscapes, in a country still not affected by mass tourism (at least at the date of this trip review). HOW TO GET TO BOTSWANA? At the time of this travelogue, flying to Botswana wasn't convenient due to poor schedule and high costs, therefore my actual gateway to Botswana was Johannesburg in South Africa, from where the trip has started aboard the same vehicles used later for the safari. The overland trip from Johannesburg to the first place of interest in Botswana, requires one full day with an early morning departure. If you still would like to fly, Maun in central Botswana or also Gaborone may be a good gateway to the country, alternatively, you may fly to Victoria Falls (or Livingstone) which is quite close to Botswana's northern national parks. The actual entry and exit points in Botswana depend also on the tour package that you will book, so your travel agent will provide additional details about how to get to Botswana. HOW TO ORGANIZE A SAFARI TRIP TO BOTSWANA? This safari tour was booked via Jenman African Safaris and actually operated by Drifters using a small truck for game drivers in Africa, for about 15 people. The truck's sides are modified to maximize the visibility and, in most cases, it's possible to climb on the roof, to observe the landscape and the animals from top, in full comfort and safety. I consider this much better than traditional off-road cars and jeep. The accommodation was mainly in tents or small guest houses where available (in most cases, the tents where set-up each night in a different place and we have camped often "in the middle of nothing"). Beside the suggested tour operators, there are many more offering safaris to Botswana using a variety of vehicles and accommodations to suit all the budgets and personal preferences. If you have enough experience in off-road driving in a 4x4, the country is also safe enough (at least, at the date of this travelogue) for self-drive tours, but I can't help on this, since I've never tried it. WHAT IS THE BEST TIME TO VISIT BOTSWANA? There is actually no best time to visit Botswana, as each season offers the chance to view the landscape in different conditions (green or dry) with animals engaged in various activities. However, especially if this is your first trip to Botswana, I recommend to choose the austral winter (roughly from May to October) as this season offers stable weather with lot of sun and tracks in better conditions, making much easier to drive. The dry vegetation in winter allows you to locate the wildlife more easily and, in addition, the prolonged drought forces animals to concentrate around the few pools of water still left, virtually guaranteeing the sighting. The rainy season in Botswana runs from November to April, when some roads may become impassable and when everything becomes green. 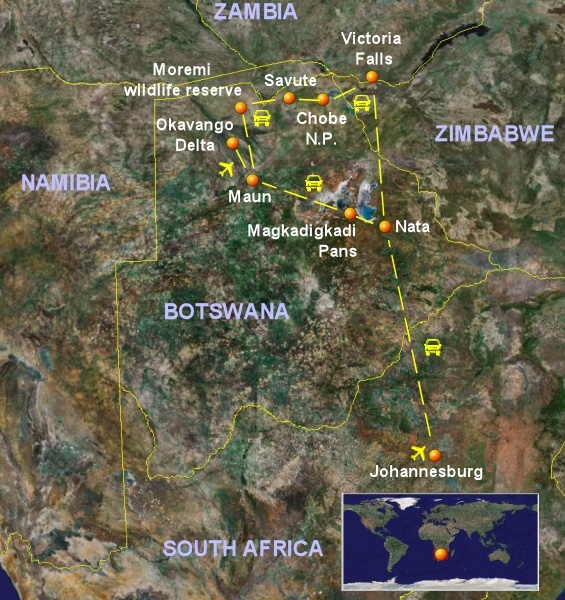 Flight from Rome to Johannesburg through Paris and long overland day transfer from Johannesburg to Nata in Botswana, using the same vehicles subsequently used for the actual safari trip. This lets to save some money, avoiding to fly all the way to Maun, Gaborone, Victoria Falls or Livingstone. Excursions to the salt lakes and onto salt flats of Magkadigkadi in Botswana, where we have spotted many pelicans and several other birds. Although missing from many Botswana tour packages, this region is particularly interesting for the unusual landscape dominated by vast salt flats and for the bird life. Getting from Maun to Okavango delta requires a short flight by light aircraft from Maun airport, followed by a 4x4 drive and by a mekoro (the traditional boat used by locals) trip to the designed campsite area. Seen several giraffes, monkeys, impalas, marabous, pelicans and African fishing eagles. The Okavango delta is a true natural wonder: a river that never reaches a sea, but dies on the sands of Kalahari desert, in a huge labyrinth of channels and islands, hosting a unique ecosystem. During walking safaris, we have spotted giraffes, elephants, warthogs, antelopes, pelicans and marabous. An area in northernmost Botswana, on the margins of Okavango delta, where a huge variety of animals is concentrated. During the game drives, we have spotted cheetahs, zebras, giraffes, impalas, a lion, hippos, warthogs, a jackal, elephants, baboons, vultures and many colorful birds. The Savuti area is particularly suggested to observe lions and this is one of the few places in Africa where, at the end of the driest season (generally in September), the lions attack and eat elephants. Beautiful game drive at sunset, with lions feeding on an elephant's carcass in the middle of a very dry savannah. In Chobe National Park there is the largest concentration of elephants of the entire Botswana. We have spotted also many giraffes, antelopes, crocodiles, African fishing eagles, mongooses and much more. In Chobe, I've seen also the most beautiful baobabs of all the trip, creating a unique landscape together with colorful sunsets. During this day tour, I visit the part of Victoria Falls within Zimbabwe, as this is the widest and the most beautiful area of the waterfall, if compared to Zambia's. In Victoria Falls, many day tours and activities are offered to tourists in order to better enjoy all the surroundings. Trip to Uganda visiting the national parks where most of the savannah's wildlife can be spotted, followed by a trekking to spot the rare and endangered mountain gorilla. Extensive safari to Tanzania visiting the parks of the north, up to the border-line with Kenya. Here you can spot virtually all the typical animals of the African continent.